The Dow is having a party and most tech companies aren’t invited. With the exception of HP (HPQ) – which has led the Dow in 2013 with a 49.3 percent increase – the Dow’s run up to an all-time high of 15,354.40 on May 17th has had little effect on tech companies. That’s because big companies – like those that make up the Dow – have recovered faster and better from the global recession. Plus, they’ve been the primary beneficiaries of Federal Reserve policy, including low interest rates and improved access to capital. As of May 17th, the Dow stocks that have gone up most this year are Disney (DIS) (33.7 percent), Boeing (BA) (31.3 percent), Microsoft (MSFT) (30.6 percent) and American Express (AXP) (27.6 percent). Except for Microsoft, these are stocks your grandmother would own to live off dividend income. This slighting of tech is nothing new. Since April 2000 – when the dotcom bubble burst – most tech stocks have been second-class citizens. Consider the NASDAQ. 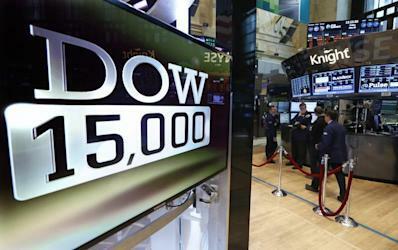 While the Dow has been at historic highs, the NASDAQ has gone up – reaching 3,498.97 on May 17th. But it’s lagging the Dow in record-setting performance. Its historic high is 5,046.86, achieved on March 9, 2000. Which means the NASDAQ is still 31 percent off its high-water mark. 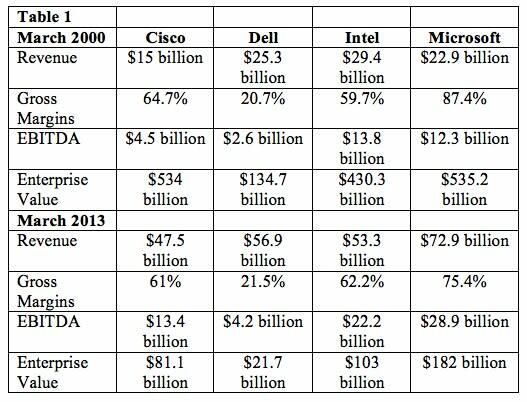 Then there are the valuations of the so-called “four horsemen” – Cisco (CSCO), Dell (DELL), Intel (INTC) and Microsoft. These companies dominated tech in the 1990s and the early 2000s. The data in Table 1 is based on the MW IT Index® and shows that between March 2000 (right before the crash of April 2000 and when most tech stocks hit all-time valuation highs) and March 2013 (exactly 13 years later) these four companies lost a lot of value. Over that 13-year period, Cisco lost 84 percent of its enterprise value, Dell’s value shrank 84 percent, Intel took a 76 percent hit, and Microsoft had a 66 percent decline. Another hard reality is that these companies likely won’t regain their previous valuations. Cisco would have to grow at a 45 percent compound annual growth rate over the next five years to achieve its March 2000 valuation. At its size, this will not happen. The public markets’ relative lack of interest in tech leaders travels down the IT value chain. Also hard hit are IT services firms, outsourcers and resellers. For them, IPOs are simply off the table. This, too, is not new. In 1999 – the last full year before the crash – there were 308 technology IPOs. According to statistics from the National Venture Capital Association, there were 49 in 2012 and just 8 in the first quarter of 2013. In 2013 so far, the largest tech IPO was West Corp. (WSTC), which raised $425 million at an offering price of $20 per share on March 27th. West Corp’s stock closed at $22.60 per share on May 17th. One exception in the IT sector is SaaS. There were two notable SaaS IPOs in 2012, Splunk and Workday. Splunk went out in April at $17 a share with a market valuation of about $1.6 billion. Workday followed in October, going out at $28 a share and a valuation of $4.5 billion. At market close on May 17th, Splunk’s stock price was $45.44 per share, and Workday closed at $67.98. But most IT companies have just two options for liquidity: private equity or acquisition. Of the two, private equity has emerged in 2013 as the bright star. In February 2013, Dell founder Michael Dell and PE firm Silver Lake Partners proposed a $24.4 billion acquisition of Dell that would take the company private. The situation is still unresolved. In early April, CompuCom announced that it will be acquired by Thomas H. Lee Partners in a transaction reportedly valued at $1.1 billion – the third time it has been acquired by a PE firm since 2004. Most recently, on April 22nd, Softchoice announced that it will be acquired by Birch Hill Equity Partners for about $412 million. The advantage of going private for these companies is the opportunity to execute complex, long-term strategies away from the impatient eye of Wall Street. The other path for IT companies is consolidation. One notable deal in 2013 was Oracle’s (ORCL) February acquisition of Acme Packet for approximately $2 billion. Also in February, #2 retail office supply chain market leader Office Depot (ODP) announced that it will acquire #3 OfficeMax in a stock swap initially valued at $1.2 billion. The exception is CDW, a $10.1 billion provider of technology solutions that filed an S1 in March, seeking to raise $500 million. The outcome of a CDW IPO remains to be seen, but if it goes public at a fair valuation, everyone in IT – from Dell and HP on down – will benefit from a display of renewed interest in tech by the public markets. Still, given the scarcity of IPO opportunities for IT companies, and low valuations for publicly traded IT companies, we expect to see many more go-private deals and consolidations in the coming years. So for now, big consumer products companies can party in public like it’s 1999 while IT companies will have to be content with small private dinner parties. But here is final food for thought: Which party runs the greater risk of crashing and burning?